The burgeoning neighborhood of Mission Bay has seen an immense amount of growth throughout its history. Years ago, Mission Bay was a cove of peaceful, protected water, becoming a natural habitat for a variety of shellfish, birds, and other small animals. Native American tribes came to take full advantage of this abundance and began to settle in the area. During the California Gold Rush, Mission Bay still yielded a plentiful amount of oysters, clams, and other marine life to feed the thousands of people of San Francisco. However, from 1860 to 1910, Mission Bay’s waters grew smaller and was quickly filled with sand, rocks, and debris from the earthquake of 1906. 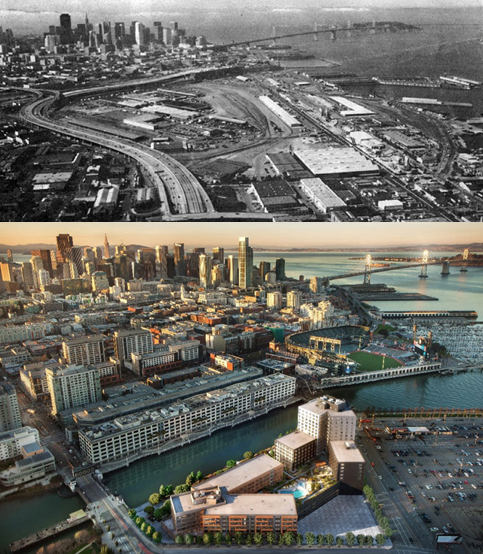 It remained an industrial zone into the 20th century and in the 1990s, the Mission Bay Project was put into action to alter over 300 acres into a planned community. The Mission Bay Project is San Francisco’s largest urban development project since the construction of Golden Gate Park. Fast forward to today the area has attracted significant corporate and civic investment with the recent ground-breaking of the future office campus for Uber Technologies and the Chase Center, future home arena for the Golden State Warriors as well as eight acres of parks and outdoor space planned as part of the Mission Rock project. With the Central Subway Project well underway, the continued evolution of the area ensures that residents will enjoy convenience and ease of access to the city making it ideal for residents working in San Francisco as well as those commuting to the Peninsula. ONE Mission Bay continues to create overwhelming excitement in the burgeoning Mission Bay district. A park-like setting with a bike path is planned to connect ONE Mission Bay to the existing Mission Creek Park. In addition to easy access to transportation, jobs, and cultural events, dining options abound in the area – from casual food truck fare at the Yard at Mission Rock, to rooftop dining at Stem Kitchen, to Michelin-starred cuisine at Saison. New residents have jumped quickly to claim their coveted spot at ONE Mission Bay, which features two residential buildings comprised of a 16-story high rise, a six-story midrise and 41,000 square feet of amenities situated on a 2.2-acre waterfront site. Don’t wait until it’s too late, find out why so many people are purchasing a home at ONE Mission Bay. Visit our Sales gallery. Hours are 11am-6pm daily. For an appointment, call 415.820.1000.